This article is about the tube line in London. For other uses, see Victoria line (disambiguation). The Victoria line is part of the London Underground network. It is a deep-level underground metro line that runs from Brixton in south London to Walthamstow Central in the north-east. It started running in 1968. On the Tube map it is shown with a light blue color. It is the fourth busiest line on the London Underground network. It is the only line on the Underground, other than the two-stop Waterloo & City line, which is completely underground. The only section of track to come above ground is the route to the depot from Seven Sisters to Northumberland Park. The Underground line has hump-backed stations which allow trains to store gravitational potential energy as they arrive and to then use this energy as they leave the stations. The stations are on top of small hills, or humps. As the train travels up the hill to the station its weight helps it to slow down. As the train leaves the station it travels down the hill, with gravity helping the train to speed up. This saves 5% energy and makes the trains run 9% faster. Each new platform built for the Victoria Line is 132.6 metres long. 183 million people use the Victoria line each year. A new tube railway running from Victoria to Walthamstow was first proposed by a Working Party set up by the British Transport Commission in 1948. The main purpose of the line was to relieve congestion in the central area. The Private Bill needed to build it was introduced into Parliament in 1955. The Bill described a line from Victoria to Walthamstow (Wood Street). There was also a proposal for an extension from Victoria to Fulham Broadway station on the District line, but this was not included in the Bill. The construction work on the Walthamstow–Victoria section began in 1962. It continued until 1972, when Pimlico station was opened. A test tunnel from Tottenham to Manor House under Seven Sisters Road had been constructed in 1959 and this was later integrated into the running tunnels. The Prince of Wales and the Duke of Edinburgh visited the line during its construction. In July 1968, they visited the tunnels that were being built under Vauxhall Park. Barbara Castle, the Minister of Transport gave approval on 4 August 1967 to build the Brixton extension. Preparatory work started at a site on Bessborough Gardens near to Vauxhall Bridge Road in May 1967. On 28 June 1968, Richard Marsh, then Minister of Transport approved the proposal to build a station at Pimlico. The name "Victoria line" dates back to 1955. Other suggestions were "Walvic line" (Walthamstow Central station–Victoria station) and "Viking line" (Victoria station–King's Cross station). During the planning stages, it was known as Route C. Later, it was named the Victoria line after Victoria Station by David McKenna. This suggestion was seconded by Sir John Elliot. The Victoria line was designed to get rid of build-ups of traffic on other lines, such as the Piccadilly line. It was also designed to have as many interchanges as possible, and all stations except Pimlico have an interchange with at least one other London Underground or National Rail line. It had been intended to build the line past Walthamstow Central to Wood Street (Walthamstow), where it would come above ground to terminate next to the British Railways station. However, a late decision in 1961 saw the line cut back to Walthamstow Central station. Until 1968 this station was called Walthamstow (Hoe Street). Each Victoria line station apart from Pimlico was built as an interchange station and several existing stations were re–arranged to allow for cross-platform interchange with it. In some cases this was achieved by placing the Victoria line platforms on either side of the existing station. In others the Victoria line uses one of the older platforms and the existing line was moved toto a new platform. At Euston, northbound Victoria and Northern line (Bank branch) trains run along platforms next to each other, although they are travelling in opposite directions. "Same-direction" cross-platform interchanges are available at Stockwell (with the Northern line), Oxford Circus (with the Bakerloo line), Highbury & Islington (with First Capital Connect, originally the Northern City Line) and at Finsbury Park (with the Piccadilly line). 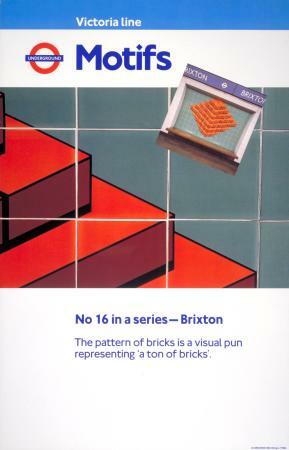 All Victoria line stations were originally tiled in a light blue colour. Each station was decorated with tiled motifs on seating recesses to differentiate them from each other. During the construction of the Jubilee line in the late 1970s, the original motifs on Green Park station were replaced by motifs matching the new design for the Jubilee line platforms. Platform humps were installed on all Victoria Line stations, except for Pimlico, during late 2010 and 2011. This was done to provide step-free access to trains. The Rail Vehicle Accessibility (Non Interoperable Rail System) Regulations 2010 and the Disability Discrimination Act 1995 created the need for the humps to be installed. The humps are a ramp type, similar to those being installed on some mainline stations. They are of a masonry construction. 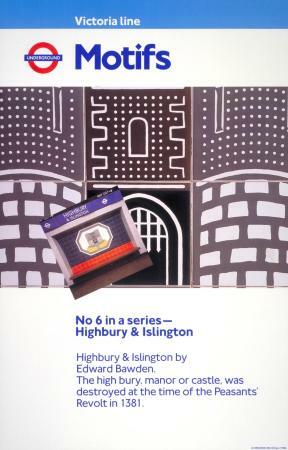 The first section opened was between Walthamstow Central and Highbury & Islington. There was no opening ceremony for this. The normal timetable started on 1 September 1968. The first train left Walthamstow Central for Highbury & Islington at about 6.30 am. Later that year, the section between Highbury & Islington and Warren Street was opened. Again there was no ceremony. The official opening ceremony for the line took place at Victoria station on 7 March 1969. Queen Elizabeth II unveiled a commemorative plaque on the station concourse. After a short ceremony, she bought a 5d (old pence) ticket and travelled to Green Park. In new pence this would be about 2.08p. Princess Alexandra opened the Brixton extension on 23 July 1971. She made a journey from Brixton to Vauxhall. 2009 stock at Green Park tube station. Trains run every two minutes during peak periods (when its the busiest). In normal service, all trains run from Brixton to Seven Sisters. About three out of five continue to Walthamstow Central. When the line first opened it was served by a fleet of 8-car 1967 tube stock trains. Each is made up of two four-car units. Later on, a number of cars of 1972 Mark I tube stock were adapted to work with the 1967 stock. This meant that there were finally 43 trains, each of which was made up of two four-car units. The 1967 tube stock was replaced by 2009 tube stock between 2009 and 2011 (see below). At first, an articulated type of rolling stock was considered. This idea was not used because it would have been to difficult to move the stock to Acton Works for heavy overhauls. This is no longer a problem since train overhauls have been moved away from Acton Works to the builders' own works. The new 2009 tube stock has a wider profile and slightly longer carriage. This prevents it from running on other deep-level tube lines. The line has an Automatic Train Operation system (ATO). The train operator (driver) closes the train doors and presses a pair of "start" buttons. If the way ahead is clear, the ATO drives the train at a safe speed to the next station and stops there. This system has been in place since the line opened in 1968. This makes the Victoria line the world's first full-scale automatic railway. When the Victoria line was built, there were severe budget restrictions. As a result, the station infrastructure standards were lower than on older lines and on later extension projects. Examples of these lower standards include narrower than usual platforms and undecorated ceilings at Walthamstow Central, Blackhorse Road and Tottenham Hale. This also affects lighting levels. At most stations between the up and down escalators there is a concrete staircase where an additional escalator could be installed, but has not been fitted. It can cause severe congestion at peak times. This has been remedied at Brixton in 2004 and at Vauxhall in 2006 where an additional escalator has been installed in place of the fixed stairway. In addition, there have been station closures for safety reasons, when both escalators have been unserviceable. Over many years, heavy equipment has been installed in fenced-off sections at the ends of platforms owing to the lack of anywhere else to install them. It is not clear from Transport for London's Five-Year Investment Programme whether these shortcomings are likely to be remedied. The 1967 stock was replaced bit by bit from July 2009 as part of Transport for London's 5-year £10 billion redevelopment project. The replacement for the line's 1967 tube stock is the 2009 tube stock built by Bombardier Transportation. The first train was built in 2006. Testing of the new trains began in 2008. The main fleet began to be introduced in 2009 and went into main service in 2010. The last of the 1967 stock trains ran on 30 June 2011, after which the whole service was provided by 2009 stock. Supporters of Tottenham Hotspur (and the club itself) have campaigned for a surface station to be opened next to Northumberland Park Station, next to the line's depot. This would provide an improvement in transport links, seen as essential if the club's wish to redevelop their ground and increase crowd capacity is to become a reality. The idea was looked into but Network Rail own the necessary land and need it for their own expansion plans. If the Chelsea–Hackney line is built then it will relieve a lot of congestion on the Victoria line. It will offer an alternative route across Central London between Victoria and King's Cross St. Pancras. For many years there have been proposals to extend southwards from Brixton one stop to Herne Hill. This station would be on a large reversing loop with one platform. This would remove a critical capacity restriction by eliminating the need for trains to reverse at Brixton. However, this would be expensive and cannot currently be justified on cost-benefit reasons. Given that the current line is heavily overcrowded, this is the only extension proposal that has any realistic possibility of ever existing. Even so, it would have to be seen to be effective at reducing overcrowding (by enabling trains to run more frequently) rather than adding to overcrowding to have any hope of being built. A diagram of the driving car of the 2009 tube stock. Notice explaining about step-free access. This can be found inside every Victoria line train. 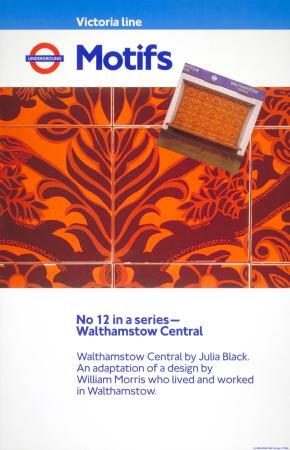 Walthamstow Central 1 September, 1968 Motif: William Morris pattern by Julia Black. 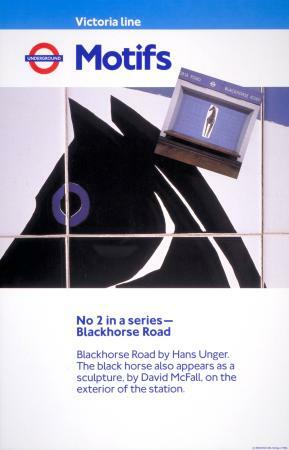 Blackhorse Road 1 September, 1968 Motif: A Black Horse by Hans Unger. 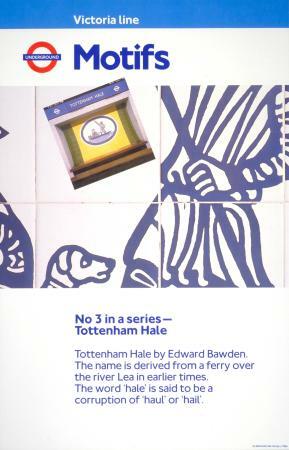 Tottenham Hale 1 September, 1968 Motif: A ferry punt by Edward Bawden — referencing the station's location on Ferry Lane and the former ferry crossing. 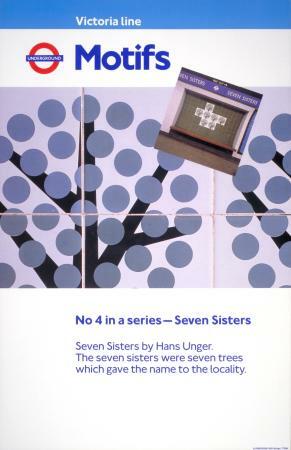 Seven Sisters 1 September, 1968 Motif: Seven Elm trees on green background by Hans Unger. 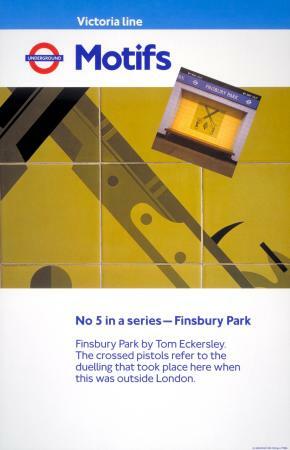 Finsbury Park 1 September, 1968 Motif: Crossed duelling pistols by Tom Eckersley — referencing the park's use as a duelling venue. Highbury & Islington 1 September, 1968 Motif: Manor House on Highbury Hill by Edward Bawden. 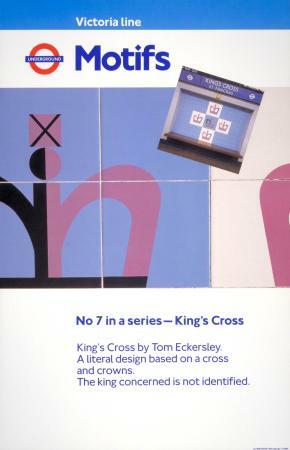 King's Cross St. Pancras 1 December, 1968 Motif: Five crowns in a cross on a blue background by Tom Eckersley. 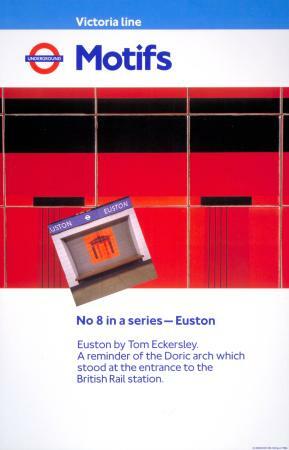 Euston 1 December, 1968 Motif: Doric Arch at Euston station by Tom Eckersley. 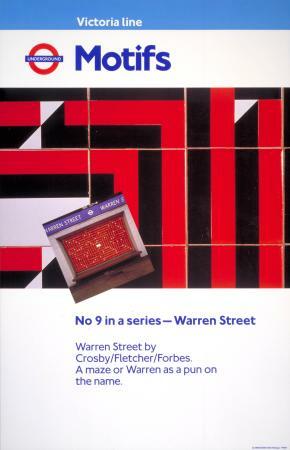 Warren Street 1 December, 1968 Motif: A maze or "Warren" by Alan Fletcher. 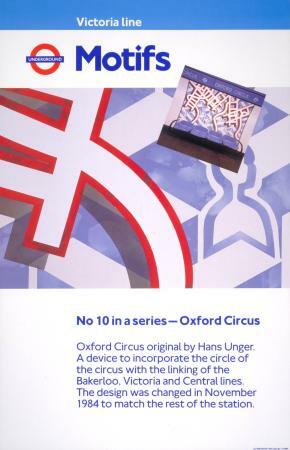 Oxford Circus 7 March, 1969 Original motif: Abstract pattern in a circle with line colours of Bakerloo, Central and Victoria lines by Hans Unger, present only on the southbound platform as of summer 2008. Second motif from 1984: Snakes and Ladders, present only on the Central platforms as of summer 2008. 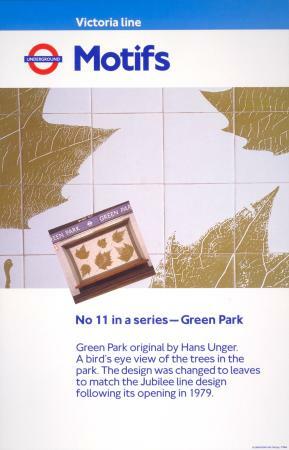 Green Park 7 March, 1969 Original motif: Green dots representing trees in Green Park by Hans Unger. Second motif from 1986: Leaves by June Fraser. Green dots restored by 2009. 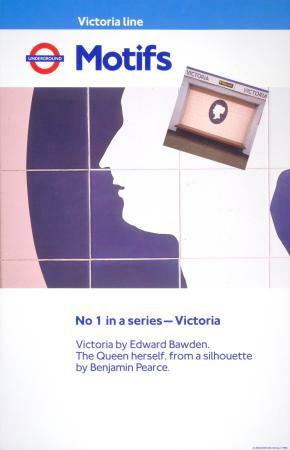 Victoria ( Trains to Gatwick) 7 March, 1969 Motif: Blue cameo of Queen Victoria on pink background by Edward Bawden. 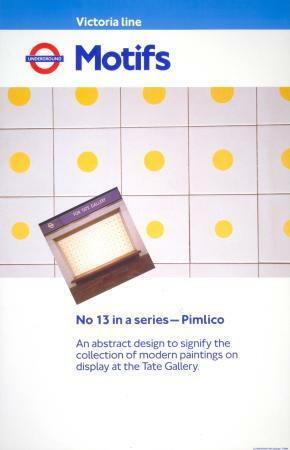 Pimlico 14 September, 1972 Motif: A pattern of varied sized spots by Peter Sedgely — modern art at the nearby Tate Gallery. 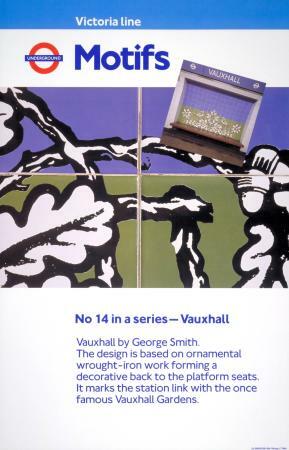 Vauxhall 23 July, 1971 Motif: Old Vauxhall Pleasure Gardens by George Smith. 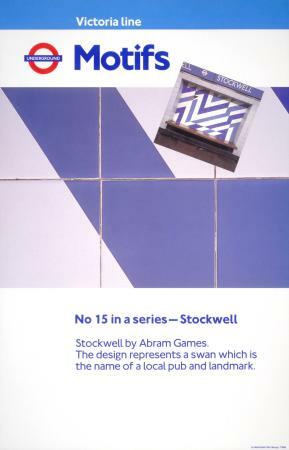 Stockwell 23 July, 1971 Motif: The Swan by Abram Games — references the name of a pub nearby. Brixton 23 July, 1971 Motif: A ton of Bricks by Hans Unger. Northumberland Park Depot is the service and storage area for trains on the Victoria Line. It is the only part of the line not in tunnel. It is located next to Northumberland Park railway station, on Tottenham Marshes, Tottenham in the London Borough of Haringey. The Depot is connected to the Victoria Line by a tunnelled branch line to a junction to the north of Seven Sisters. It was opened with the first stage of the line in 1968. There is a local campaign for platforms for the Victoria Line to be built at Northumberland Park station. This is supported by the Haringey Council and by Tottenham Hotspur F.C. ; the platforms are seen as essential to the club's plans to increase capacity at their White Hart Lane ground. ↑ "LU Performance Data Almanac". Transport for London. 9 July 2012. tab: "Passenger Journeys". Archived from the original (xlsm) on 16 August 2012. Retrieved 1 August 2012. ↑ "Northumberland Park Depot". Metronet Rail. Archived from the original on 2006-05-05. Retrieved 2009-06-30. ↑ "Tube Prune - London Underground Statistics". Tube Prune. 2003-04-21. Retrieved 2009-06-30. ↑ MacKay, David J.C. (2008). Sustainable Energy - without the hot air (Free full text). ISBN 978-1-906860-01-1. ↑ 5.0 5.1 "2009 Tube Stock on Track" (PDF). London Underground Railway Society. Retrieved 2009-07-12. ↑ 6.0 6.1 6.2 6.3 6.4 6.5 6.6 6.7 6.8 Mike Horne. The Victoria Line. Capital Transport. ↑ Cooke, B.W.C., ed. (April 1955). "Proposed New London Underground". The Railway Magazine (Westminster: Tothill Press) 101 (648): 279–281. ↑ "CULG - Victoria Line". Retrieved 2009-07-15. ↑ "Tube Update Plan — Victoria". Transport for London. Archived from the original on 26 February 2014. Retrieved 6 December 2011. ↑ "Creating Step Free Access for All" (PDF). Marshalls. Archived from the original (PDF) on 11 July 2015. Retrieved 6 December 2011. ↑ "Journey Planner timetables". Transport for London. Retrieved 2009-06-30. ↑ Hardy, Brian (2002) . London Underground Rolling Stock (15th ed.). Harrow Weald: Capital Transport. pp. 10, 12. ISBN 1 85414 263 1. ↑ Day, John R. (1969). "XI. The trains". The Story of the Victoria Line. Westminster: London Transport. p. 81. 968/2719 RP/5M. "Driverless metros poised to expand". Railway Gazette International. 2000-03-01. Archived from the original on 2011-01-25. Retrieved 2007-10-25. These trials matured into 'attended ATO'. London's Victoria line was the first into revenue service on September 1 1968, with Philadelphia's Lindenwold line close behind in January 1969. "Automatic Train Operation on the Victoria Line". The Tube Professionals' Rumour Network. Tube Prune. Retrieved 2007-09-06. ↑ Geoff Marshall (Geofftech) (3 July 2011). Last 1967 Victoria Line Train. Seven Sisters and Brixton stations: YouTube. Retrieved 26 January 2019. ↑ "alwaystouchout.com - Victoria Line to Northumberland Park". www.alwaystouchout.com. Wikimedia Commons has media related to Victoria Line. Wikimedia Commons has media related to Victoria line station Motifs. "Victoria Line Underground Stations – Facts, Trivia And Impressions". 22 October 2012. Retrieved 30 January 2013. "Victoria line". Clive's UndergrounD Line Guides. 2007-12-30. Retrieved 2009-07-11. "Automatic Train Operation on the Victoria Line". Tube Prune. 2003-03-15. Retrieved 2009-07-11. "BCV (Bakerloo, Central & Victoria) Upgrade". Alwaystouchout.com. 2006-09-08. Retrieved 2009-07-11.